The growth of location-based technologies has not escaped anyone’s notice as location continues to revolutionize location-based services, analytics, advertising revenue opportunities and much more. The Location Based Services (LBS) and Real-Time Location Systems (RTLS) market itself is growing at a CAGR of 37.1% and is expected to reach 54.95 Billion USD by 2020, from 11.36 Billion USD in 2015. Clearly, location is moving beyond GPS and the impetus is transforming it into ubiquitous indoor and outdoor hybrid technologies like Wi-Fi, Bluetooth Low Energy (BLE), Micro-Electro-Mechanical Systems (MEMs), and Magnetic Field. Li-Fi technology, introduced during a TED Talk in 2011 by University of Edinburgh Professor Harald Haas, has been the latest one to join this prolific list of location-based technologies. Li-Fi or Light Fidelity refers to a new wireless form of Visible Light Communication (VLC) technology, a subset of Optical Wireless Communication (OWC), which utilizes the light emitting diodes as a medium to enable high–speed communication. Data is transmitted by modulating the intensity of LED light at nanosecond intervals, too quick to be detected by the human eye. In more than five years since its introduction, Li-Fi is now being touted as a breakthrough in 5G Visual Light Communication (VLC) systems and the future of wireless Internet access. Li-Fi is currently attracting a great deal of interest. However, in spite of the buzz around it, most people have no clue about the way it functions and how it is different from other highly effective location-based technologies like Wi-Fi and iBeacon. In one of our previous posts, we have already answered some basic questions about Li-Fi—right from the origination of Li-Fi to how Li-Fi works to the difference between Li-Fi and iBeacon (BLE) technology. 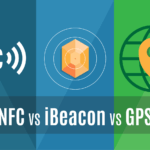 In this post, we bring you a detailed analysis about where this relatively new technology stands against Wi-Fi and beacons. In addition, we answer some frequently asked questions about Li-Fi. 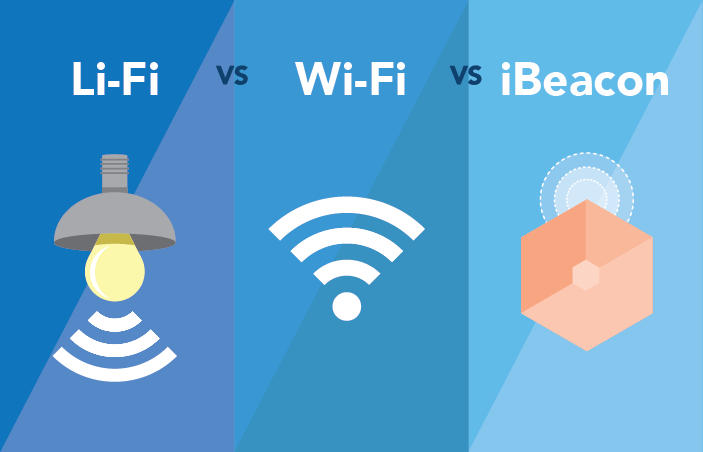 How is Li-Fi different from Wi-Fi and iBeacon (BLE) technology? Li-Fi: The term ‘Li-Fi’ was coined by German Physicist Harald Haas and introduced by him during his 2011 TED Talk. It was here that he first demonstrated how light from an LED bulb could transmit more data than a cellular tower. Wi-Fi: Tipped off by the 1985 visionary ruling by Federal Communications Commission (FCC) allowing the use of bands of wireless spectrum without the need for a government licence, the new ethernet standard compatible devices and technology working on radio waves came to be known as “Wi-Fi” only in 1999.
iBeacon: This proximity marketing technology was first introduced by Apple at the Apple Worldwide Developers Conference in 2013. It uses beacons which are low-cost, low-powered transmitters equipped with Bluetooth Low Energy or BLE that can be used to deliver proximity-based, context-aware messages. How is Li-Fi different from Wi-Fi and iBeacon? Li-Fi: Li-Fi is a form of Visible Light Communication (VLC) technology. VLC technology is an optical wireless data communications medium which uses visible light between 400 and 800 THz (780–375 nm) to transmit binary data in the form of light pulses. Wi-Fi: Wi-Fi is based on Radio Frequency (RF) technology which uses a frequency within the electromagnetic spectrum associated with radio wave propagation. 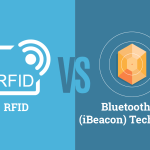 iBeacon: iBeacon technology leverages Bluetooth Low Energy technology (also called Bluetooth Smart or Version 4.0+ of the Bluetooth specification) which is the application-friendly version of Bluetooth, built for the Internet of Things (IoT). Li-Fi: Li-Fi utilizes the light emitting diodes as a medium to enable high–speed communication. Information is transmitted in the form of binary data by modulating the intensity of LED light at nanosecond intervals, too quick to be detected by the human eye. This data is then received by a photosensitive detector. Thereafter, the light signal is demodulated into electronic form. Li-Fi uses an LED bulb to send information via the optical spectrum whereas Wi-Fi uses the radio spectrum. Both the technologies work in a similar manner. Wi-Fi: When a radio frequency current is supplied to an antenna, it creates an electromagnetic field capable of propagating through space. Devices equipped with wireless network adapters detect the wireless signal broadcasted by access points and tune into it. iBeacon: It uses low-cost, low-powered transmitters called beacons, equipped with Bluetooth Low Energy, that transmit a signal which allows another device to determine its proximity to the broadcaster. The beacon doesn’t transmit content, it simply transmits a signal which has small bits of data, typically a unique identifier. 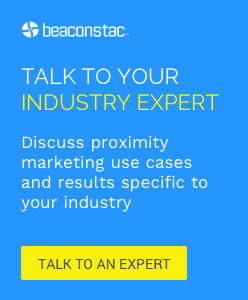 This allows mobile apps to differentiate between beacons and perform an action when necessary. 1. Is this new technology an alternative to Wi-Fi or beacons? a) Since light diffuses at a faster frequency than radio waves, the connection speed will be significantly higher than in the case of Wi-Fi. b) Li-Fi provides a much more secure connection than conventional radio technologies, because unlike Wi-Fi network signals, Li-Fi is based on light and can’t penetrate through walls, making it more secure from external sniffing. It also means that there is less interference from other devices. Irrespective of the speed of Li-Fi which is 100 times faster than Wi-Fi, it is best to say that both the technologies are complementary to each other and can be use used together for ideal results. 2. What are the barriers for the wide adoption of Li-Fi technology? 3. What are the latest developments in the Li-Fi space? Last year, the Ministry of Industry and Information Technology of China announced that a Chinese system of Visible Light Communication or Li-Fi had managed to achieve a traffic rate of 50 Gbits per second. The speed record for information dissemination still belongs to researchers at the University of Oxford, who managed to achieve a rate of 224 Gbits per second. Li-Fi technology made its way out of laboratories to live trials in 2015. It has already been tested at places such as museums and shopping malls in France and in countries like Belgium, Estonia, and India. It was tested within offices in Estonia’s capital city, Tallinn, based on solutions from the Estonia-based startup, Velmenni, which has leveraged the relatively new technology to design a smart lighting solution for commercial and industrial environments. The implementations demonstrated speeds of up to 1Gbps with orders of magnitude faster than Wi-Fi. Even higher bandwidths have been obtained in lab conditions. 4. Where can Li-Fi be implemented? a) In some electro environments such as hospitals or airplane cockpits, it can be difficult acquiring a seamless internet connection by radio waves since the risk of interference is very high. Li-Fi technology would be a good alternative in such areas. b) Li-fi can be used to build an omnipresent navigation system by utilising the traffic lights system already in place as is being tried out in the municipality of Meyrargues, France, which inaugurated its public Li-Fi network in November last year. c) Any interaction with a light emitting machine or appliance can be channelised to give out more information on spot. For instance, Li-Fi can also can be used to interact with television sets. 5. What does the future hold for Li-Fi? The market analysis for Li-Fi technology looks promising. According to Global Market Insights Inc, the Li-Fi market size is anticipated to reach USD 9 billion by 2023, at over 80% CAGR from 2016 to 2023. The U.S. Li-Fi market is predicted to hold the majority share and is estimated to be valued at over USD 12 billion by 2023. ABI Research’s report, “Visible Light Communications: The Future of Retail Indoor Location?”, states that LED and Visible Light Communications could be the key to unlocking $5 billion indoor location market while a MarketsandMarkets research report “Global Visible Light Communication(VLC)/Li-Fi Technology & Free Space Optics (FSO) Market (2013-2018)” forecasts that Visible Light Communication (VLC)/Li-Fi Technology market is expected to reach over $6 Million by 2018 with an estimated CAGR of 82% from 2013 to 2018. Businesses are either planning to invest in Li-Fi or have already done so. For instance, Apple Insider claims that Apple might incorporate Li-Fi technology in future iPhones and iPads. On the other hand, a UAE-based technology company Zero.1 has already tested Li-Fi and will be rolling it out by the end of 2016 in Silicon Oasis, Dubai, thereby making it the first city in the world to get a full-scale Li-Fi service via its streetlights. The company is now planning to start delivering ‘lightning speed’ internet to users in French Polynesia. The rapid adoption of LED light bulbs has created a massive opportunity for businesses to leverage VLC technology or Li-Fi. In addition, the bandwidth crunch caused by increased data usage by Wi-Fi and cellular radio systems is also cumulatively pushing the market growth for this new technology as network providers are turning to alternatives like beacons and Li-Fi to relieve the internet traffic. Also, bluetooth beacons and Li-Fi are an efficient alternative to RF that bring in a greener and cheaper future of communication. Is this similar to http://www.airfinder.com or http://www.bluvision.com? Lovely and beautiful post look at best bluetooth transmitters for tv for more details about bluetoooth transmitting devices.